BTE: Behind-The-Ear (BTE) hearing aids typically have the most circuit options and are able to provide more power than any of the custom made in-the-ear aids. 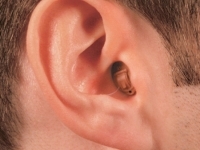 BTE’s “sit” on the back of your ear and are connected to a custom-made earmold. Many of these aids can now be fitted with a nearly invisible slim tube instead of the traditional plastic tubing. 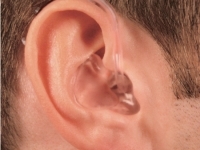 Open BTE: Open Behind-The-Ear (BTE) hearing aids use tiny casing and a nearly invisible slim and transparent tube. Open fittings offer a cosmetically appealing option and are quite comfortable to wear. The dome that fits on the end of the tube makes these instruments less noticeable than aids with custom earmolds. ITE: In-The-Ear (ITE) hearing aids are more visible, but are the easiest to handle of the custom made hearing aids. They have a longer battery life than any of the other in-the-canal ear hearing aids. Because of its size, it can house the most options inside the aid such as T-coils, volume controls, larger venting, and antennas without much difficulty. ITC: In-The-Canal (ITC) hearing aids are slightly less visible than ITEs. The batteries do not last as long since they are smaller than the ITE, but better than the smaller battery of the CIC. They can offer some of the many features of the ITE, without completely filling up the ear. CIC: Completely-In-the-Canal (CIC) hearing aids are one of the more cosmetically appealing custom made aids. 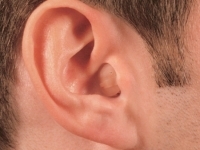 They usually require a “removal string” due to their small size and their deep fitting into the ear canal. CICs do not usually have manual controls because they are too small. CIC hearing aids have the shortest battery life. RIC: Receiver-In-Canal (RIC) hearing aids are similar looking to the open fit BTE’s. 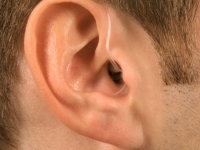 Instead of the small tube directing the sound from the hearing aid to the ear canal, it has a small wire connecting a receiver to the hearing aid. 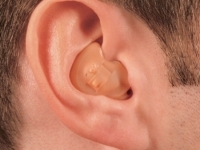 Since the receiver is not in the hearing aid itself, it can often reduce the overall size of the aid for the most petite fitting behind the ear.